Straw poll: When someone begins a sentence with the phrase, “One of the real surprises of fall camp so far is…” are the words that follow a compliment? Perhaps the question to answer before that one is this: What must one do to qualify as a "real surprise” in the fevered run-up to the start of a new college football season? Over-perform? Over-perform after under-performing? Would a guy who only two years ago was considered one of the top two receivers in Texas qualify as a “real surprise” by turning some heads in practice? No? What if that guy hadn’t caught a pass in his two years in Aggieland? Quartney Davis, a third-year wide receiver from Houston, fits both of those descriptions. When he signed with the Aggies out of Langham Creek High School in 2016, Davis was a consensus top 20 player in Texas and top 15 wide receiver nationally. There was talk of him contributing immediately as a true freshman. So far this fall Davis has been reliable and consistent, two qualities Fisher looks for in WRs. Several months later as A&M players took the field for fall camp, Davis wasn’t among them. Before his career as an Aggie ever began, Davis suffered a torn ACL and was sidelined for the duration of the 2016 season. As Davis began his second year on campus, reports on his progress were cautiously optimistic. He caught a touchdown pass in the 2017 spring game, but as the year unfolded, his reality reflected more of the caution than the optimism. Davis participated in eight games but never caught a ball in live action. 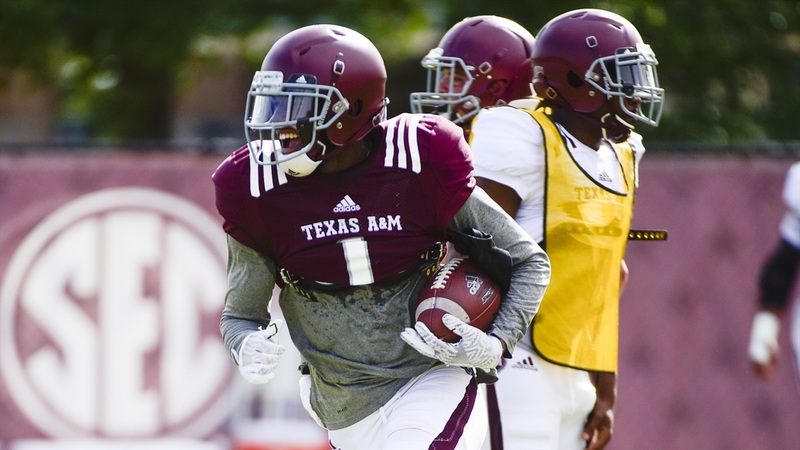 Several months later as the A&M players are in the thick of their second week of fall camp, Davis finds himself the consistent recipient of that peculiar compliment: One of the real surprises of fall camp so far is Quartney Davis. Or at least that’s the August buzz around the practice fields in the shadow of Kyle Field. And it seems to be more than just camp hype among those eager for a new story. 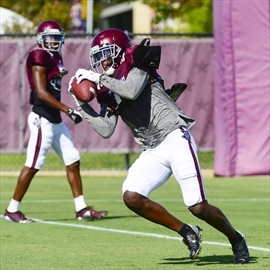 Davis has practiced with the first team four days in a row, and A&M coach Jimbo Fisher, who is careful not to go too far in singling out players publicly, has mentioned Davis more than once. Fisher acknowledged he wasn’t witness to most of the long path Davis has traveled from heralded recruit to a guy fighting to be a whole football player again, but he’s happy to be around for his reemergence. He’s (Davis) running routes, he’s catching the ball, he’s making people miss. He’s short, he’s deep. He’s being the kind of football player he was in high school. He’s playing a very significant role. A very significant role in a Fisher-led offense is, well, very significant. Fisher has coached multiple elite receivers in previous stops at LSU and Florida State, including first round picks Kelvin Benjamin, Michael Clayton, and Dwayne Bowe. And the Aggie boss makes no secret about his desire to have a couple of go-to wide receivers. If the buzz and practice trends are any indication, Davis has positioned himself to be in the mix as one of those game-changers. So if you replied “no” to our poll question, feel free to change your answer. In Quartney Davis’ case, there is no doubt that being called one of the real surprises of fall camp is, indeed, high praise. And more importantly, it’s a compliment that suggests that Davis has a real shot to be one of the real surprises of the 2018 season. Q has a lot of talent and skills. I support him. WWG1WGA. Look forward to seeing him help this team. Hope he makes it all the way back from his injury and plays great. Good for him. I forgot how highly recruited Quartney was coming out of high school, and we are seeing the reason why now. Keep it up Quartney! 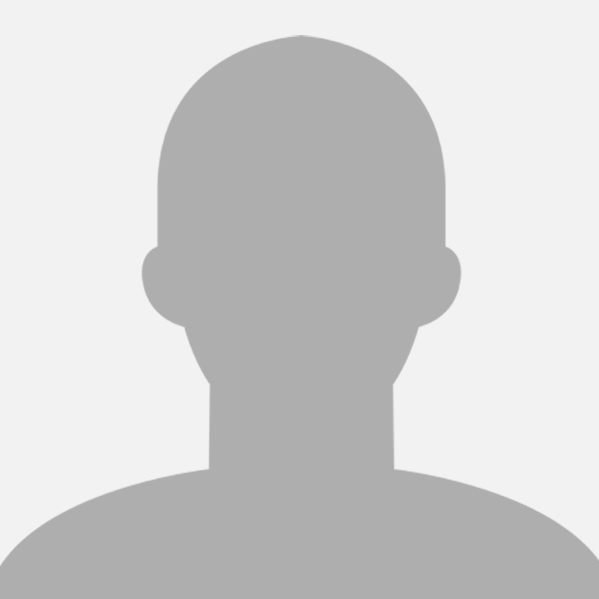 Quartney - if you reading this, wishing you all the best coming back from difficult circumstances. Great training for life! Will be watching you have a great year. Thad is probably the best pure writer on staff. And good for Quartney!! Glad to hear he looks to be all the way back from the injury. Clean slate without moorehead playing favs. Good luck. Hope this is a break out year for you.